Make way for these young fellas who may well be destined to be crowned iconic boybands of this generation. Give it up for WHY DON'T WE! 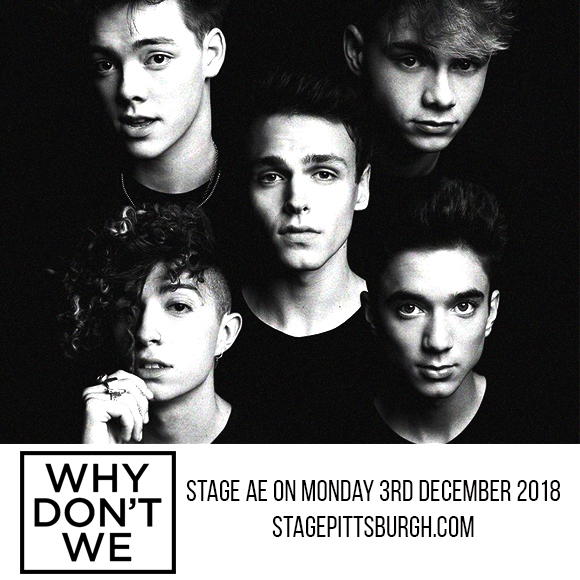 Brace yourselves, the WDW mania is spreading like wildfire, hitting this side of town on Monday, 3rd December 2018 at Stage AE, Pittsburgh, Pennsylvania. With their ever-growing number of fans, the demand for tickets is definitely on the rise. What are you waiting for? Don't let this 'best-concert-ever' moment just pass you by. Quickly hit that 'buy ticket' button to have this dreamy and wildly fun encounter with Why Don't We. Dreamy vocal harmonies – check! Fantastic dance moves – check! Charismatic showmanship – check! Captivating good looks – check! Great hair – check! Why Don't We has all that it takes to be touted as one of this generation's iconic boybands. Their massive online subscribers exploded into colossal fandom who are not only engaged with their online content and personas but are exuberant followers who live and breathe for moments that would allow them to bask in their high energy performance on the live stage. Why Don't We is a quarter pop group consisting of Jonah Marais, Corbyn Besson, Daniel Seavey, Jack Avery, and Zach Herron. All have had online following prior to grouping together, and Daniel has been one of the top-12 in American Idol Season 14, which he joined at the age of 15, making him the youngest finalist of that season. After officially forming the band Why Don't We in 2011, they immediately released their debut single, "Taking You." Since then, they release an unbroken string of hit songs which include "Something Different", "Invitation", "Help Me Help You," and " 8 Letters". You definitely should not let this instagrammable moment go pffft! Click 'buy tickets' and look forward to an insanely great show that would keep you and your friends obsessed forever!